Zamboanga Sibugay (Cebuano: Lalawigan sa Zamboanga Sibugay; Chavacano: Provincia de Zamboanga Sibugay) is a province in the Philippines located in the Zamboanga Peninsula region in Mindanao. Its capital is Ipil and it borders Zamboanga del Norte to the north, Zamboanga del Sur to the east and Zamboanga City to the southwest. To the south lies Sibuguey Bay in the Moro Gulf. Zamboanga Sibugay is the 79th province created in the Philippines, when its territories were carved out from the third district of Zamboanga del Sur in 2001. Hence it the fourth newest province, being before now-defunct Shariff Kabunsuan (October 2006), Dinagat Islands (December 2006) and Davao Occidental (2013). Zamboanga Sibugay was formerly part of Zamboanga del Sur. Attempts to divide Zamboanga del Sur into separate provinces date as far back as the 1960s. Several bills were filed in the Philippine Congress, but remained unacted. The new province was finally created by Republic Act No. 8973 signed into law by President Joseph Estrada on November 7, 2000. On February 24, 2001, R.A. 8973 was ratified through a plebiscite conducted in 44 municipalities of Zamboanga del Sur and Pagadian City. Zamboanga del Sur Third District Representative George Hofer was elected as its first governor in 2001. Presently, former Diplahan Mayor Wilter Palma is the governor of the province, while the representatives of the first and second districts are Atty. Belma Cabilao and Dr. Dulce Ann K. Hofer, respectively. Zamboanga Sibugay covers a total area of 3,607.75 square kilometres (1,392.96 sq mi) occupying the south-central section of the Zamboanga Peninsula in western Mindanao, at 7°48’N 122°40’E. To the north it intersects the common municipal boundaries of Kalawit, Tampilisan, and Godod of Zamboanga del Norte. It is bordered to the west by the municipalities of Sirawai, Siocon, and Baliguian, to the south by the Sibuguey Bay, and to the east by the municipalities of Bayog and Kumalarang of Zamboanga del Sur. It is further bordered on the southwest by Zamboanga City. The climate of the province is moderately normal (climate type III). Annual rainfall varies from 1,599 to 3,500 millimetres (63.0 to 137.8 in). Temperature is relatively warm and constant throughout the year ranging from 22 to 35 °C (72 to 95 °F). The province is situated outside the country's typhoon belt. Zamboanga Sibugay comprises 16 municipalities, organized into two congressional districts and further subdivided into 389 barangays. The population of Zamboanga Sibugay in the 2015 census was 633,129 people, with a density of 180 inhabitants per square kilometre or 470 inhabitants per square mile. The vast majority of the people of Zamboanga Sibugay speak Cebuano and Chavacano. Other languages such as Subanen and Tausug, among others, are also spoken, followed by English. The province is predominantly Christian, Roman Catholic affiliation as the predominant Christian sect. Various Christian groups also present such as Baptists, Born-again Christians, Jehovah's Witnesses, Church of Christ of Latter Day Saints, Iglesia Ni Cristo, and Seventh-Day Adventist. Muslim comprises about 17% of the population. The leading industries are in the areas of semi-processed rubber, rice and corn milling, ordinary food processing, wood and rattan furniture making, dried fish and squid processing, and home-made food processing. New industries include concrete products, garments, wax and candle factories, lime making, and other home and cottage industries. Major crops produced include rice, corn, coconuts, rubber, fruit trees, vegetables, tobacco, coffee, cacao, and root crops. Livestock and poultry productions are predominantly small-scale and backyard operations. Coal mining in large and small scale and precious metal mining in small scale category are likewise present in some areas of the province. IN BUUG; There are two colleges in Buug. One is the government-owned, Mindanao State University - Buug Campus which offers courses in education, liberal arts, agriculture, and aquaculture. It also has a high school which also serves as the laboratory school of the College of Education. The other is the privately owned and medically inclined St. John General Hospital and College, Inc. Another private school, managed by the Sisters of St. Paul of Chartres is also located here, the St. Paul School (formerly Holy Trinity Academy) which offers primary and high school education. The first high school which opened in Buug is Gabaldon Institute which is now called Western Mindanao Institute, another privately owned school. The first technical and vocational school which opened in buug year 2009 is INTERNACIONAL COLEGIO DE TECNOLOGIA (ICT) which offers courses in Electronics and Communication Technology, Electrical Technology, Information Technology, Hotel and Restaurant Management, Automotive and Metal Technology and now also offers SHS Grade-11 and Grade-12 courses offer in Academic Track in GAS and TVL Track in Industrial Arts strand, ICT strand, and Home Economics Strand. managed by ZALDY MASAYON GUMALANG the School President (SP-GUMALANG). ^ "List of Provinces". PSGC Interactive. Makati City, Philippines: National Statistical Coordination Board. Archived from the original on January 21, 2013. Retrieved 31 July 2014. ^ a b c d Census of Population (2015). "Region IX (Zamboanga Peninsula)". Total Population by Province, City, Municipality and Barangay. PSA. Retrieved 20 June 2016. ^ "Republic Act No. 8973; An Act Creating the Province of Zamboanga Sibugay from the Province of Zamboanga del Sur and for Other Purposes". PhilippineLaw.info. Retrieved 28 September 2013. 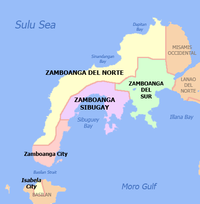 ^ a b c d "Province: Zamboanga Sibugay". PSGC Interactive. Quezon City, Philippines: Philippine Statistics Authority. Retrieved 8 January 2016. ^ a b c Census of Population and Housing (2010). "Region IX (Zamboanga Peninsula)". Total Population by Province, City, Municipality and Barangay. NSO. Retrieved 29 June 2016. ^ Garcia, Bong (4 June 2015). "Rubber processing facility upgraded". Sun.Star Zamboanga. Sun.Star Publishing, Inc. Retrieved 19 April 2016. THE Department of Science and Technology (Dost) has improved the rubber processing facility in Zamboanga Sibugay, as part of the agency’s effort to upgrade the rubber industry in the region.